When winter comes around, the last thing on my mind is eating healthy and exercising (especially when there’s all those comforting, chocolatey treats to enjoy). But the truth is, this is probably the best season to get an exercise routine going – if you can do it in winter, you can do it at any time, right? That’s why I decided to give S.W.E.A.T 1000 a try. When I decided to go to my first class, I was quite nervous because I didn’t know what to expect. I had heard a few things about it – how hectic it was and I just pictured myself falling over and fainting before I’d even gotten started. Plus, when I told my friends and colleagues about what I was embarking on, they basically wished me good luck and added that they hoped I would survive this crazy experience (I was hoping for a little more encouragement than that). Anyway, if you don’t know, S.W.E.A.T stands for ‘Specialised Weight Endurance Aerobic Training’, with 1000 representing the calories burned in a one-hour workout. The thought of walking through the doors at the S.W.E.A.T Studio at Bluebird Shopping Centre was rather intimidating, but I was immediately welcomed by friendly staff. I was then greeted by the instructor who asked me if it was my first time there – when I said yes, he talked me through the process and how the treadmills work. A S.W.E.A.T class is basically running and walking on a treadmill at different speeds and inclines… you just have to follow the speed and incline levels that the instructor tells you. They also combine this with floor work like squats, push ups, weight lifting and crunches (so you alternate between the treadmill and floor work). To add to the fun, you do this to loud, dance music, lasers and with a smoke machine. I can honestly say that I was pushed to the max and there were moments where I thought I was crazy for trying it out… but I still walked out of there feeling exhilarated. 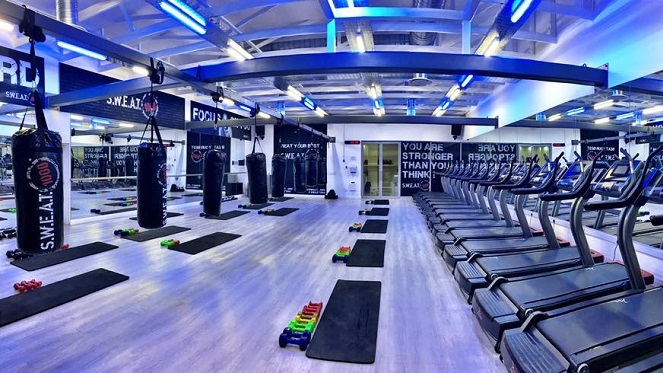 There is something about being in that studio with loud music pumping, the instructor pushing you harder and everyone in there giving it their all that makes it energetic and fun! My muscles ached afterwards but I left that studio feeling like superwoman. Needless to say, I’m completely hooked and I cannot wait for my next class.